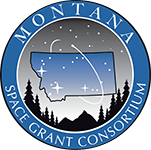 The Space Public Outreach Team (SPOT) provides FREE presentations about current NASA missions and research to Montana schools, youth programs, and community groups. The offices at Montana State University in Bozeman and University of Montana in Missoula sends presenters to schools and communities across the state. The focus of the program is professional training for higher education student presenters with mentoring by STEM graduate student managers. Through this program higher education students utilize unique NASA content to become inspirational STEM role models for K-12 students and teachers. The interactive SPOT presentations utilize slides, videos, animations, iClickers (depending on group size) and an inquisitive approach to relay the excitement of new discoveries in space science. NASA research and careers here in Montana are highlighted in each show. Presentations can be done in a classroom or assembly setting, as long as a screen or blank wall and an electrical outlet are available. Each show lasts approximately 50 minutes. Participating teachers will receive NASA related activities, brochures and other materials they can use in their classrooms. Interested in being a SPOT presenter? Email us!